Code Pink (or CODEPINK) is a left-wing advocacy group founded in 2002 by Jodie Evans and Medea Benjamin. It was created to oppose the 2003 Iraq War but also focuses on “social justice” by using “feminist principals [sic].” It is well known for its support of Palestinian interests, the Communist Castro regime in Cuba, as well as other anti-American governments and groups. Code Pink often uses street theater and demonstrations of “civil resistance” to protest war while promoting a left-wing view on political issues. 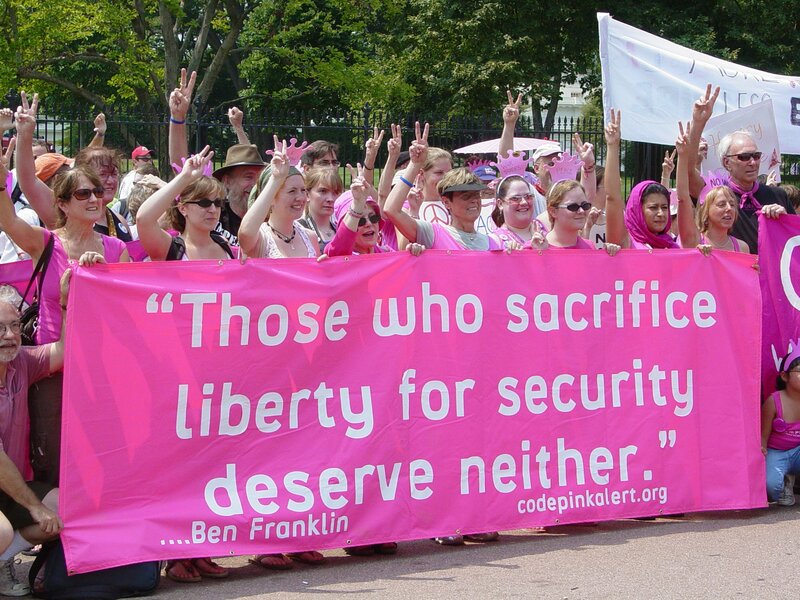 During the reconstruction of war-torn Iraq in 2004, Code Pink, along with Global Exchange and United For Peace and Justice, established Iraq Occupation Watch (IOW). Code Pink was also endorsed the Civil Liberties Restoration Act of 2004 which was created to reverse certain national security measures put in place after the 9/11 terrorist attacks. In 2004, Code Pink co-founder Medea Benjamin traveled to Jordan to provide the “refugees” of Fallujah with $600,000 worth of humanitarian aid. Code Pink is a supporter of the “Boycott, Divestment, and Sanctions” (BDS) campaign which seeks to ostracize Israel from the international community. Israeli officials have barred entry to the country by Code Pink under a law prohibiting foreign activists for BDS from entering Israel. Code Pink endorses the Free Gaza Movement, which promotes similar ideals as the Beirut Communique. The organization traveled to Egypt in 2009 with the intent of entering the Hamas-governed Gaza Strip. Although Egyptian authorities prevented most of the 1,300 activists from entering Gaza, 100 were allowed through the border. Code Pink released a statement on what it called the “Gaza Freedom March,” claiming that the actions of the activists drew “worldwide attention” to the supposed “siege” of the blockaded terrorist-ruled statelet. During a Code Pink protest at the 2015 annual conference of the American Israel Public Affairs Committee (AIPAC), one demonstrator displayed the flag of the terrorist organization Hezbollah while others held signs that drew similarities between Israel and ISIS. Members of the organization traveled to Pakistan in 2012 to protest American drone strikes on al-Qaeda targets in the country. Code Pink conducted a tour with controversial anti-American left-wing Pakistani politician Imran Khan as he attempted to promote peace with the Taliban. The Pakistani military refused to let Khan and Code Pink enter a Taliban-controlled region near the border of South Waziristan, forcing the group to make their way back to the capital city of Islamabad. The organization has visited Cuba multiple times, including a “delegation” to the country in February 2015, and an “Activists Tour” in November 2015. It has also praised the communist nation, and its former leader Fidel Castro, many times. Outside of protests and visits to anti-American countries, Code Pink has attempted to “arrest” political figures it deems to be “war criminals.” During a Senate hearing in January 2015, members of the organization accosted former U.S. Secretary of State (and Nobel Peace Prize laureate) Henry Kissinger. According to the organization’s 2016 tax form, Code Pink’s total income was $1,401,321, while its total expenses were $1,031,031. Although the organization has a lack of transparency regarding its donors, key funders of Code Pink include the Benjamin Fund, Threshold Foundation, and New Priorities Foundation. It has also received other donations from the Tides Foundation, the Barbra Streisand Foundation, and Global Exchange. Code Pink co-founder Medea Benjamin is the president of the Benjamin Fund, and co-founder of Global Exchange. Code Pink is also the business name for a non-profit called Environmentalism through Inspiration and Non-Violent Action. The address for Environmentalism through Inspiration and Non-Violent Action is the same as Code Pink’s, and its co-founder is Jodie Evans. She also claimed that the United States created the war on terror and that there were “no terrorists in Iraq.” According to Evans, the attacks of 9/11 happened because American bases were in Saudi Arabia. Code Pink co-founder Medea Benjamin lived in Communist-controlled Cuba from 1979 to 1983. She praised the communist regime of Fidel Castro while living in Cuba, before being deported after she wrote an article against certain policies of the regime. Benjamin was one of the organizers of the 1999 anti-capitalist World Trade Organization protests in Seattle. The protests turned violent when activists burned cars and smashed windows in a bid to shut down a conference of the World Trade Organization. Benjamin called the riots a “battle cry” after the activists caused millions of dollars in property damage. During the 2016 presidential election, Benjamin praised Donald Trump after he denounced the Iraq War during a television debate. “I watched the debate last night and LOVED IT,” she said. The group has supported the actions of controversial anti-war demonstrator Cindy Sheehan, but Sheehan is not formally affiliated with Code Pink. Benjamin is also president of the Benjamin Fund, and co-founder of Global Exchange, which both fund Code Pink. Code Pink is the business name for Environmentalism through Inspiration and Non-Violent Action, and is affiliated with Global Exchange and the Benjamin Fund due to Medea Benjamin’s top positions in all three organizations. “Cuba: April 29 – May 7, 2017.” CODEPINK. Accessed June 01, 2018. https://www.codepink.org/cuba_april_may_2017.